Widely regarded as the standard text on EMC, Tim Williams' book provides all the information necessary to meet the requirements of the EMC Directive. 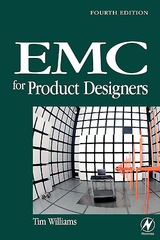 Most importantly, it shows how to incorporate EMC design principles into products, avoiding cost and performance penalties, meeting the needs of specific standards and resulting in a better overall product. This edition covers basic, generic and product-specific test standards, the latest standards on measurement methods and revisions to existing standards. Changes to the standards generating process are also covered. New measurement techniques are described. The chapter entitled Systems EMC explains requirements on systems design, layout of large systems, earthing, grounding and bonding practices, cable layout, routing and termination, and specification of components. A further chapter deals with EMC Management: discussion of management requirements, company policy, QA needs, the role of the EMC coordinator, including test and control plans. Tim Williams has worked for a variety of companies as an electronic design engineer over the last 20 years. He has monitored the progress of the EMC Directive and its associated standards since it was first made public. He is a member of the Institution of Electrical Engineers and now runs his own consultancy, specializing in EMC design and training. He is also the author of 'The Circuit Designer's Companion' published by Butterworth-Heinemann.